First off, I want to thank everyone pulling for me (via facebook, twitter, emails, brainwaves). It really was a huge team effort to finish (let alone attempt) this monstrous race. Though my immediate crew (Sarah Crosby-Helms, Jayme Burtis, Nick and Jamil Coury, Katelyn Benton, and Katie DeSplinter) were there filling up bottles, pacing miles, and disposing hugs, everyone else out there sending in love and support were awesome in giving me that “lone fighter that isn’t alone” feeling. For all those that thought of me and prayed for me, I extend my deepest gratitude. -Doing my best to fit in at the race briefing.. The crew minus the Coury brothers (in-bound from the Hardrock 100 mile) assembled early Sunday morning with the addition of the greatest crew vehicle known to man, Jayme Burtis’s LIFTED F-350 with a snugtop and (actual) bed in the back. This thing was a monster that pretty much let everyone else know that we were there to .... stuff up. We got to check-in barely on time, but got everything taken care of. We then returned for the race briefing at 330pm, where me and JB Benna entertained ourselves with commentary on the proceedings including such noteworthy quotes as “mmm, that makes me happy”. The Coury’s arrived and the crew was then 100% assembled and we headed back to Stovepipe Wells for a 2 mi shakeout together before swimming, dinner, sign and gear prep. Little did I know that stretch of highway would be a sheer corridor of hell in a few hours. We woke up at 530am the next day and headed out to the start line. We were hoping that the mentioned breakfast buffet might be included in the $895 race fee, but alas, they weren’t (although there was an included pizza party at the end with $300 slices). At any rate, Katelyn, Sarah, Jayme, and Katie headed out and we took pictures, bumped Notorious B.I.G and got ready to jiggy/moonwalk/polka for 135 miles. My body was hungry for miles, and after a few personal prayers and obligatory obnoxious comments from the RD, the race started and I settled into a casual and comfortable 7:30 pace (more or less). The 10am runners driving in were supportive and/or interested in how far out they saw me from the other runners. I know most people will question the divergence in my pace early on from later in the race, but I personally don’t regret the split I ran early on. The temperatures were low, my stride was natural and relaxed, and it felt easy. I believe in myself as a competitor, and I know that whatever the fear or apprehension that may be in my head, I have to run off my heart rate, and at that point in the race it still was comfortably low. Temps still were relatively mild as we left Furnace Creek (100-105F) and we began to slow things down to make sure the transition to the high heat was efficient and even. I began to drink more and more, and go over to the car for short breaks to try and keep my heart rate down (changing shoes from tangents to lunars, sleeves, etc). I also started using the ice blanket through aid stations, and all in all I was doing fine. We had our first crew change 15 miles out of Furnace Creek, and Sarah, Jayme, and Katelyn came in to take care of me. 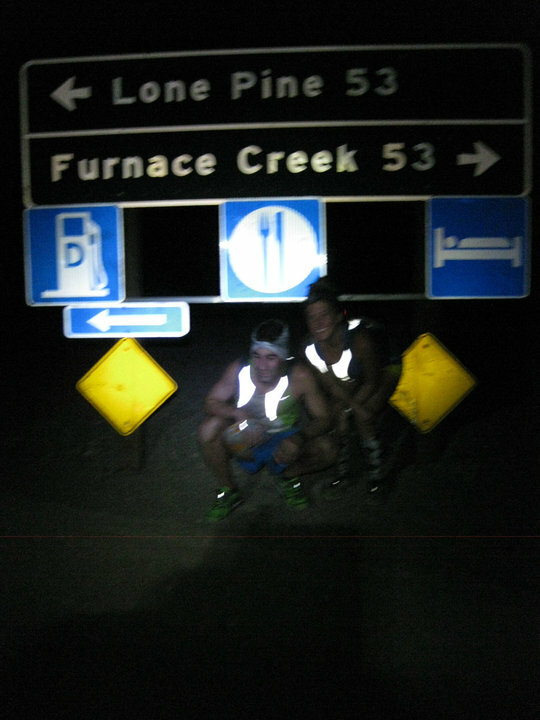 I began to run with a Czech triathlete for a bit as we rounded the big turn into the hottest part of the course, the 6 mile approach into Stovepipe Wells. The road banked left and down into a vulcanizing oven of sorts: flanked by a finger of the Panamint Range to the left and massive sand dunes to the right, this section couldn’t get any hotter, and exceeded temperatures of 125F. I knew things were wrong, but there was about a 0.8 mile downhill, and I wanted to flow with it to take advantage of gravity. When I came into the flat, it still was a very long 5 miles in. I came to the car and thought I was doing the smart thing taking the time to fix things by letting the Czech go and refuel on liquids and fruit while I sat under the ice blanket. I did this for another mile, but things only got worse, and I eventually was brought nearly to my knees when I met Sarah coming out to meet me as I began to get dizzy and hurt all over. This was the extreme heat everyone had talked about. It was here now, and though I had run some great sections, and was in a position to clock a great time at Stovepipe, I physically couldn’t. My crew and family were excited for my arrival, but I was on the edge of kidney failure, as every mile got worse into Stovepipe. Seeing concerned looks on my crew's faces, made me realize I couldn’t ignore the pain anymore even though we were so painfully close. We still had a long four miles to go to the repose (and pool) of Stovepipe Wells, but somehow, we kept me going and when I arrived, I gingerly got into the pool and began downing fluids. My crew took great care of me, but it still took 80 oz of water and Gatorade to elicit a response out of my kidneys which was the worst responses I have ever seen: brown urine. Now I’m talking about dark yellow, I’m talking coca-cola brown stuff. It is an indicator of excessive amounts of CPK in the blood and early kidney failure. 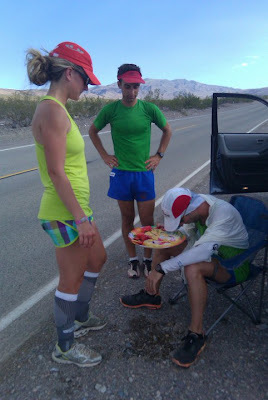 Basically, I was in 120 degree heat with kidneys that wouldn’t process water or let me pee for the next 17 miles uphill. When kidneys get shocked and stop working in Death Valley, you might as well be dead in the water. Without a doubt, this was THE MOST frustrating moments of my entire ultra running career (and I’ve had plenty of bad moments). 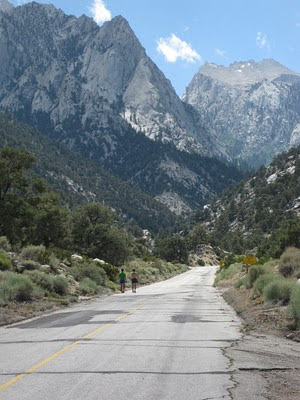 The climb up Towne Pass is 17 miles, 5,000 ft. These numbers generally excite me as it is a very run-able climb that is a cakewalk at just a couple hundred feet per mile gain. I however was reduced to a power walk as every time I began to jog, I’d cramp in my chest and get light headed. I described it to Nick as “it’s like you just had a heart attack and can’t do anything stressful without pain in the chest even though the legs are begging to fly.” So we walked, and walked, and walked, and then.. walked some more with Sarah! Despite my exceedingly pathetic state as more and more crews passed me, Sarah took good care of me keeping my spirits up as we crawled towards the top. When we finally crested, the sun had long gone down, and my nearest competition was over 10 miles down the road. I honestly believed the 48 hour cutoff may apply to me at the crawling pace I had been reduced to. Regardless of the situation at hand, I knew if I could get my kidneys back in action, we could salvage something. So, me and Katie started off in hopes of salvaging a decent time on the long descent into Panamint Valley. As we clipped off elevation signs, 4000 feet, 3000 feet, and then 2000 feet, I began to worry about overheating again and shutting off my kidneys. However, the only thing that really happened was I kept getting quicker. 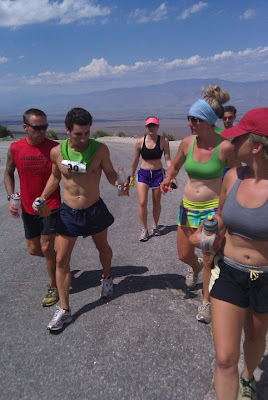 I lowered my aid station splits and picked up my pace as we approached the bottom. Katie did a great job keeping me optimistic and in control as I changed from survival mode to race mode. I hesitantly began the short 2 miles up to the resort as I believed the good luck downhill was going to lead to the painfully oppressive uphill.. But it didn’t! I climbed steadily and reached the resort smiling and ready to go. I talked to Lorie who had staked out while descending Towne Pass and ordered some onion rings. Nick began to realize my rest wasn’t really a necessary rest, that I was actually ready to charge, and we went outside to make final preps for the crew. Nick and I took off, and the magical climb began..
Knowing the course well, I looked forward to this climb. I was a bit nervous as I thought about how Towne Pass had gone for me, but we started climbing strong regardless of the fact. Thinking back to when I had ran it cautiously in the day time, I was worried I wouldn’t be able to outlast all the turns and steeper sections. Regardless of all the anxiety I had, Nick and I took the hill apart. Cautiously at first with a few walking breaks, but more and more sustained burns that were stronger than any point thus far in the race. After walk breaks, I would pick up the pace so quickly that Nick suffered a little extra indigestion. We switched up to let Jamil have some fun halfway up, and the hunting of tired 10am runners continued. Being only 60% through the race didn’t seem to stop me from wanting to pass runners with conviction as we would wait till I was ready, and then sustain a burn for upwards of 5 minutes to put the hurt on the other runner. I do regret this completely though as it wasn’t sportsman-like at all as well as a waste of energy. However in a race as long and relentless as this one, sometimes the arrogant, immature, brightly colored young crew is going to have a little fun. At any rate, we sustained a decent pace past Father Crowley Point as we passed through a long 8 mile stage that seemed to go on for far too long. An auxiliary vehicle for another crew was leapfrogging with us. With little sleep in the last 24 hours, I began to whoop and holler every time we passed them trying to sleep. They responded by curtly saying “Good evening gentlemen” and we became proper right away. We had a handheld mp3 player music box that made things immensely better. The tunes kept my mind engaged and going. We reached a point though when the road wasn’t turning and all the shooting stars and music weren’t exciting anymore. I decided I would rest before sunrise to recharge my batteries a bit and have a better morning. As we approached a bright strobe light flashing in the distance, we began to realize we’d finally made it to mile 90, Darwin. 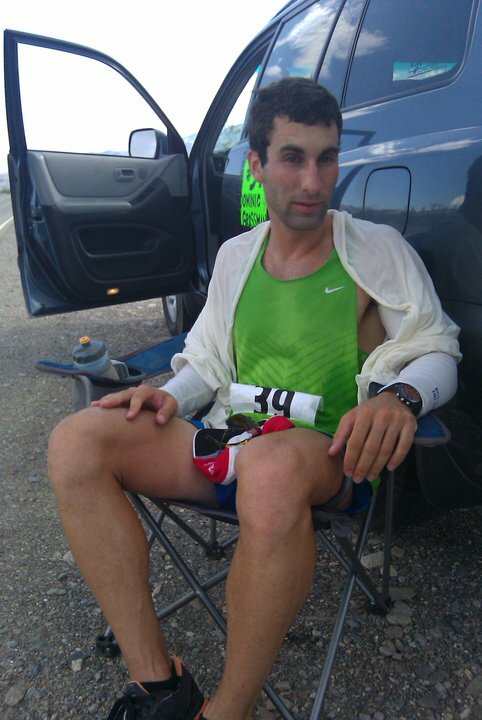 I went to the truck to rest, and ate some deli meat to help the legs recharge a bit. I only asked for 30 minutes, and I stayed awake the whole time. My body rested and relaxed slightly but was still very active as I could feel my legs percolating with blood movement. The rest turned out to be futile, as when I got up, I was locked up for a good 2 miles with more hobbling than running. I slowly got back into a running gait with Sarah, but it wasn’t pretty or easy. In fact, it was downright ugly. I was in my softest shoes, my new neon green lunar glides and the overly soft foam made the metatarsals in my forefoot fall in on themselves and cause a neuroma to begin to develop. It was hard to figure it out at the time that I needed harder shoes with a more consistent forefoot to mitigate the neuroma, but I eventually figured it out and switched out at mile 100- 23:33. I got a heavenly neuroma rub down from Sarah (who has had two in each foot), and gingerly continued with Jamil. Katie and Sarah went to rest in the aromatic sulfur mining community of Keeler. The road ahead showed Mt. Whitney and Lone Pine rather plainly. It almost seemed like the remaining 22 miles into the town were a mere stone’s throw away.. and that was tough to deal with. 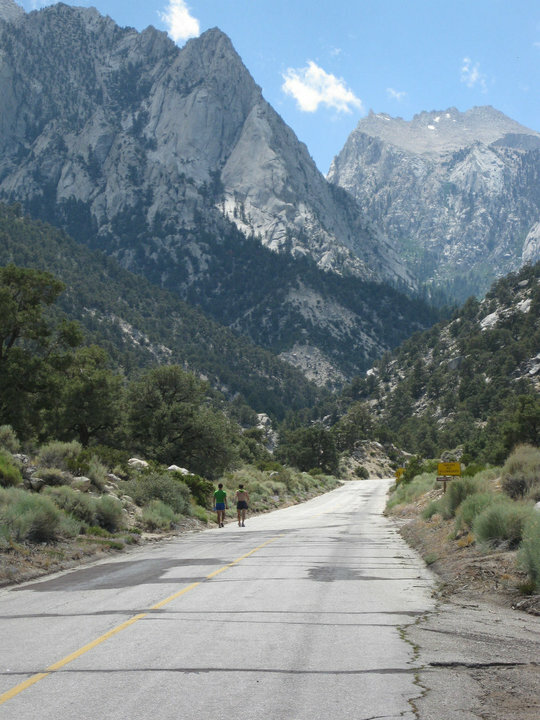 On a good day, 22 miles takes 2:30 (which is still a long time) however 100 miles deep with tender feet, I knew it was going to take much longer, and so we set out with hopes of reaching Lone Pine before noon. I began to get mental with Jamil, as I told him a few times over to not let me take my eyes off the white line 3 feet in front of me. He agreed like he was talking to a crazy person saying “that’s it buddy, keep your eyes on the line”, and I persistently did so talking back to him like I still had more than half my mind left. We hit a section of the playlist that featured the powerful vocals of Kelly Clarkson. I began to belt every song word for word even though I hadn’t listened to her for several months. We approached a worksite and in between singing like a diva, I nodded good morning to the construction workers. Though I’m sure they questioned my sanity and sexuality (for the record, I only like girls) I just kept on plugging along singing even the highest notes. After Keeler (108), Katelyn took the reins and we jogged along gingerly as she would sing with me to the songs she knew. She really was an amazing ray of sunlight as the morning sun turned the heat up and burned my exhausted body. I had an interesting bathroom break that only happens when you’ve lost all sense of modesty and ability to squat.. Uncle Jayme (though one of my most supportive fans), was absolutely disgusted by the event and probably lost a little respect for me after observing the proceedings. After 7 miles, Nick took over in a nearly identical outfit that confused some other crews that recognized the young man in his early 20’s, well tanned, and dressed in neon green top and blue shorts as me. 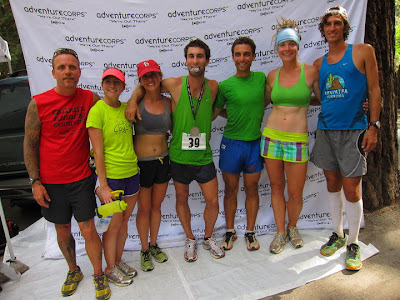 We worked well together even though I began to get in sarcastic fights with the crew for filling my bottles with too much ice leaving me with only a few oz of water each mile, and several ounces of ice I could not drink. Right about this time, the crew began to look at me like I was out of this world. Though the anger was purely sarcastic, the crew took it literally and began to think I was snapping. We eventually made it into town where I recovered with a McChicken and some Gatorade to prepare for the assault on the Mt. Whitney Portals. -The hill is as bad as the picture looks. There are moments in every race that a runner looks forward to, and knows he or she is just going to have to gut out and go to work. Badwater features a few sections like this, but the most unique one in my eyes is the 5,000 foot gain half marathon at mile 122. The nature of the climb is that it gets your attention very quickly with a steep grade after 32 miles of flat, and then it gets worse as it slowly starts to take away the oxygen, and gives you an brutal final 4 miles that get even steeper as it creeps above 6,000ft up to 8,000ft. Ordinarily, I’d call this climb “fun” and “challenging”. But at mile 122, it’s sadistic and fitting for the nature of the race. I started off with Jamil and we made decent time getting my climbing legs back in action as we started to have longer burns up the hill. The crew asserted they had lost their minds and were bouncing off the trunk as I climbed like a zombie runner (copyright). I felt like I understood what the bottom was, as I was so tired and exhausted I couldn’t imagine a worse feeling. I was in pain, but emotionally numb to anything going on. -The Buddha Jayme: super Zen, supportive and focused. He was the best thing to happen to my race, hands down. I felt like everything painful that had happened thus far, was going to try to come back, and all I could do is put my head down and press on and try to ignore the pain. I thought the backs of my legs were going to snap as I pushed my hands down on my quads to keep forward motion, but they somehow held together. -The reason I survived: this crew. Even 1 mile to go, they were still at it. We rounded the final turn from the gigantic switchback I had stared at all morning, and I put my head down afraid to look up at how far the portal still was. Katie took me home and we carefully pressed on to make sure I finished on my feet. Before I knew it, the noise and excitement of the finish line was too close to ignore, and I broke into my final sprint across the line into the “showering” praise of my incredible crew. Jayme - This guy was Mr. Cluth. 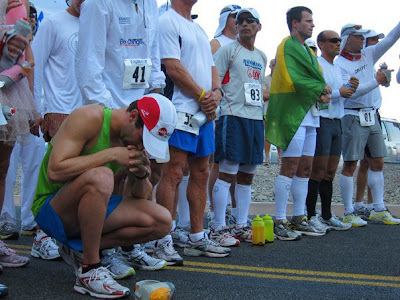 Everything I overlooked in my haste to put together my race, he was on. Tons of ice, handmade ice bandanna's, a giant truck, and everything else logistically impossible, he made happen. He was mentally/emotionally an anchor through the whole race for the crew and me. Just a good guy to the very core.. I would but my life in his hands any day. Katelyn - This ray of sunshine was always there to pick me up. If she wasn't cute, she was sweet, if she wasn't sweet, she was singing sweetly. I got a custom song about climbing up mountains sung to me on the last climb.. and yes, she is actually an awesome singer (slash) accomplished 100 mile runner with two 100's under her belt. Not your everyday Sarah Bareilles. Katie - She was the crew before there even was a crew. She put up a ton of time to help me out on trips to Badwater and saw the whole entire operation through. She was instrumental in getting my engine roaring again off Towne Pass and giving my race a second chance. I think she even helped me go potty... That in itself was probably equivalent to helping deliver a baby calf. Nick - My Arizona counterpart (sort of) we had a lot in common and he was the awesome brother I always wanted to do crazy stuff with, but never had. He was one of my best pacers keeping up with my random burst of energy at all hours of the night and being real supportive and flexible.. like a brother. Sarah - Having already crewed some great runners, she knew a thing or two about supporting a hyper competitive athlete that his/her pushes limits. Whether it was working out a neuroma with her bare hands or helping me manage my nutrition, this girl was on it like it was her profession. 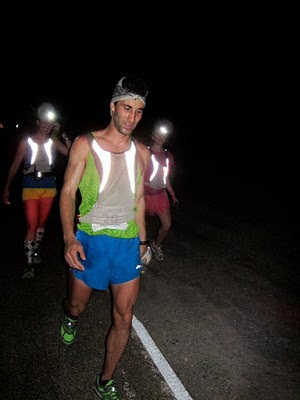 Jamil - Perhaps one of my favorite people to run with, Jamil isn't afraid to go big. 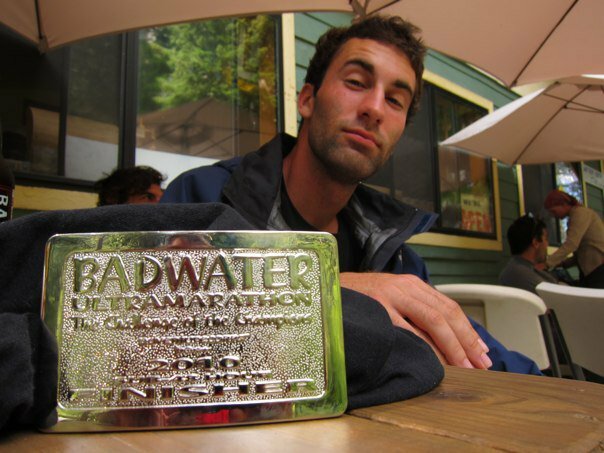 He's logical and honest but ambitious as well, and had a similar outlook on ultra running that made me feel optimistic and happy. His tax form reads "running bum" for much of the year, and his spirit reads "wild stallion" 100% of the time. He was a good sounding board for my race tactics, and always ready for more pacing. He's running BW next year.. I think. WOW, concrats and your team. I read your blog later and you are a god runner!.